Specializing in services for small-to-medium sized businesses. We have the expertise to satisfy all your online search, blogging, public relations, website and social media needs. If you are searching for a consistent message to reach your existing customers - and find new ones - then you are in the right place. Do you need a press release to reach the public or media? Do you require coverage of an event? Take a professional approach with an expert crafting of your message. In need of a new or refreshed site design? Our team of top L.I. designers will create a custom site from soup-to-nuts. If your current site lacks a webmaster to keep your content fresh, we can manage it for you. So you have a great looking website, but now what? What is it really saying to customers? Do you need a blog to keep things fresh? Are you communicating effectively or lacking critical content to fill those beautiful pages? In SEO, content is king and we can help you reign supreme! 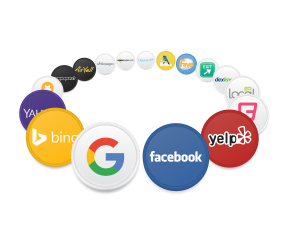 Our partnership with an international search firm will place your business on over 100 websites with 70 enhanced listings on major platforms such as Google, Bing, Yahoo, Apple and Yelp. Help build your local SEO with trusted links. Run a scan of how your business appears online now by clicking here! Build your brand in a consistent and strong manner through use of your logos, tag lines, and streamlined messages all through a unique voice. We can also help manage or respond to your online reviews. We will help your company stay relevant in your customer’s thoughts by regular engagement through social media. Your fans will feel connected to you on a more personal level, thus driving them to use your product or service more often.